I did my usual sorting routine. 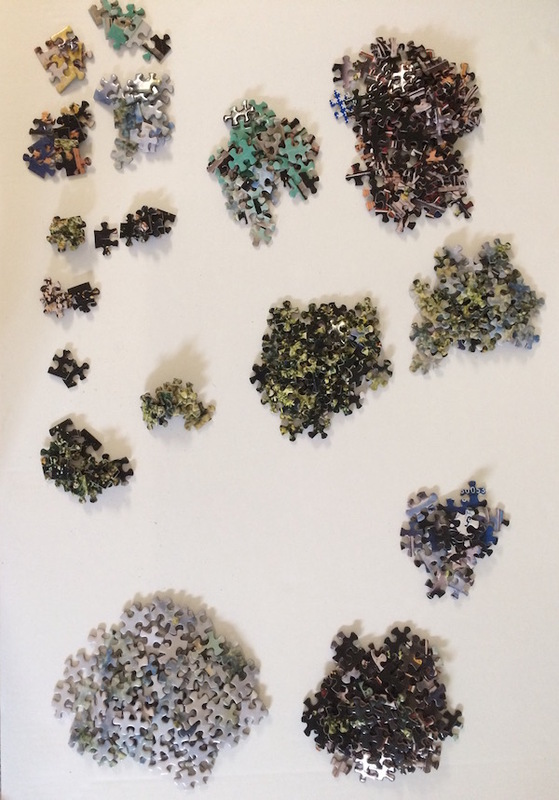 Placing the pieces into the 'general-color' piles. Then I carried on with a second round of sorting (similar colors sorted by shades/patterns) while placing the pieces flat out on the poster boards. I started with the most obvious colors first being the greens, a little blue/red and silver. 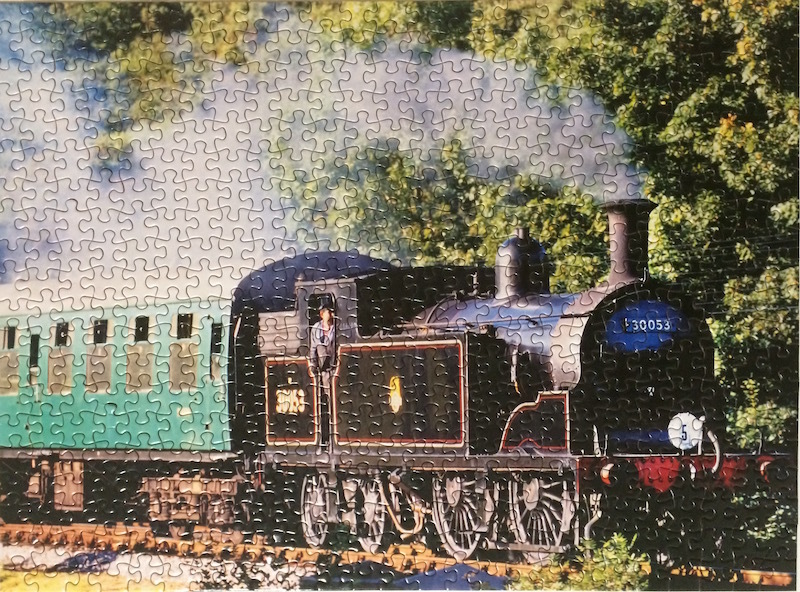 Then it was assembling from the bottom up until it came down to green trees and steam white. This is a photograph image and areas were not really clear, especially where the man at the doorway is standing. But that's just while looking at it close up - stepping back the man appears more visible. 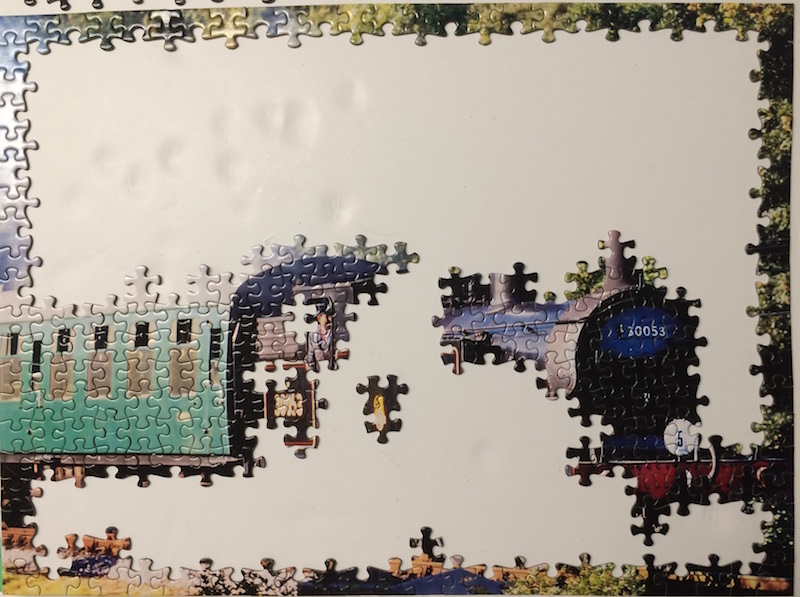 The pieces felt good for board thickness and quality however when trying to move pieces of sections to different areas, they could not be lifted without falling apart. That meant dragging the sections around the board which is doable of course. 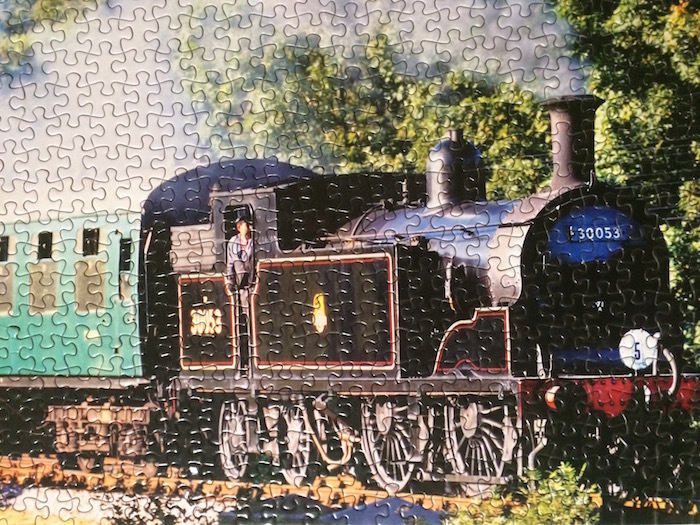 Here are some close up images of the steam train itself - see how clearly the man appears. Also you may note how the pieces and smooth, flat and interlock nicely. 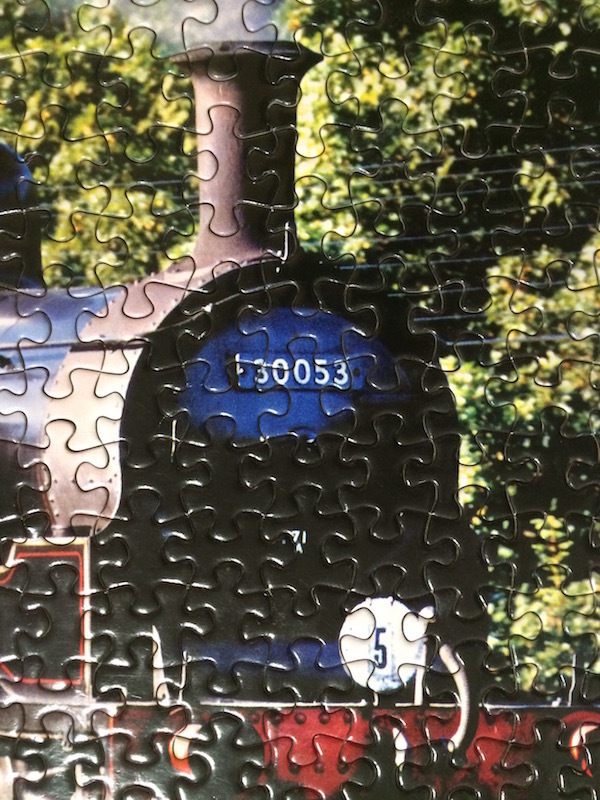 The Steam Train photographic jigsaw puzzle is part of a 10 pack. 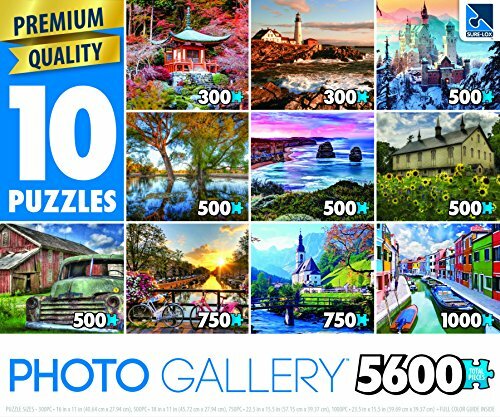 Sure-lox calls these the Puzzlers Collection which are made up of Photographic images. 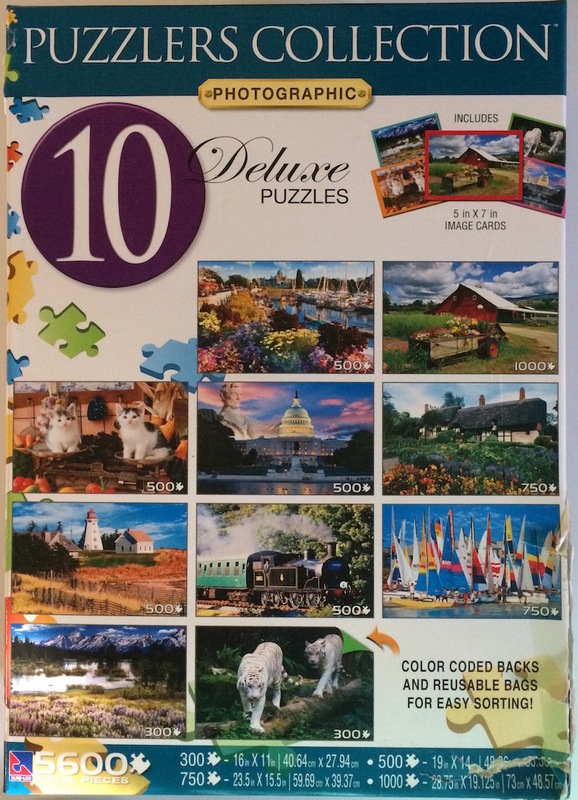 Also they refer to them as Deluxe Puzzles. 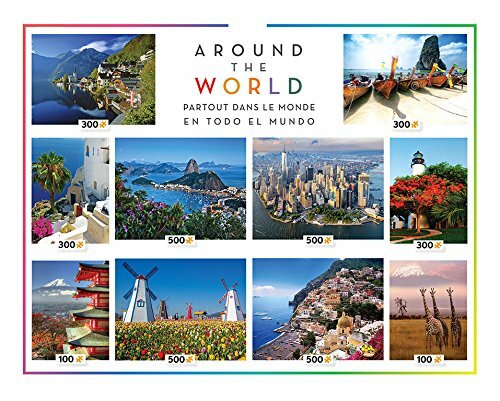 The following image shows the variety of photographs in this collection. The box is damaged somewhat at the side which is surprising because it is actually made of very heavy quality. 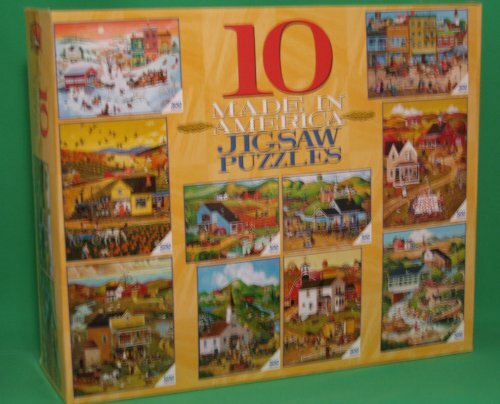 I purchased this one at the Thrift Store for $4.00. 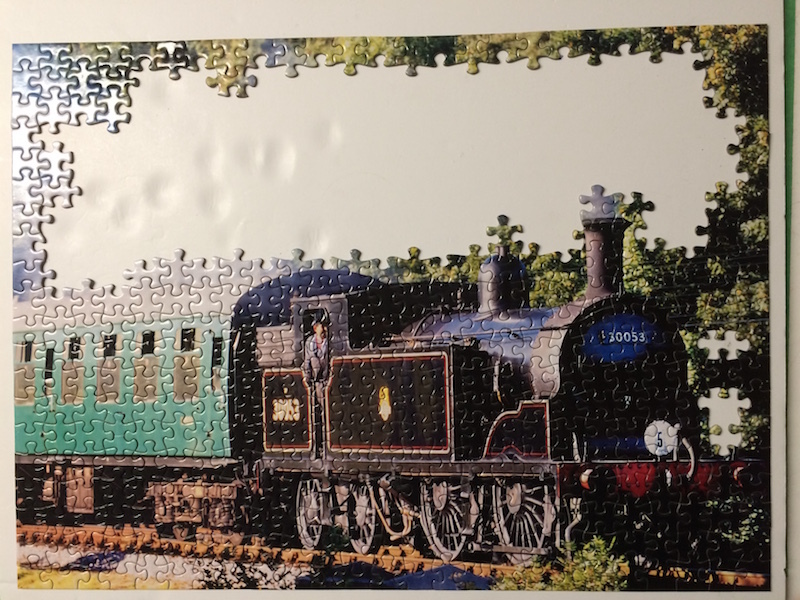 Even the pieces are of good quality and when I completed the image I could actually pick up the entire puzzle and it stayed together. 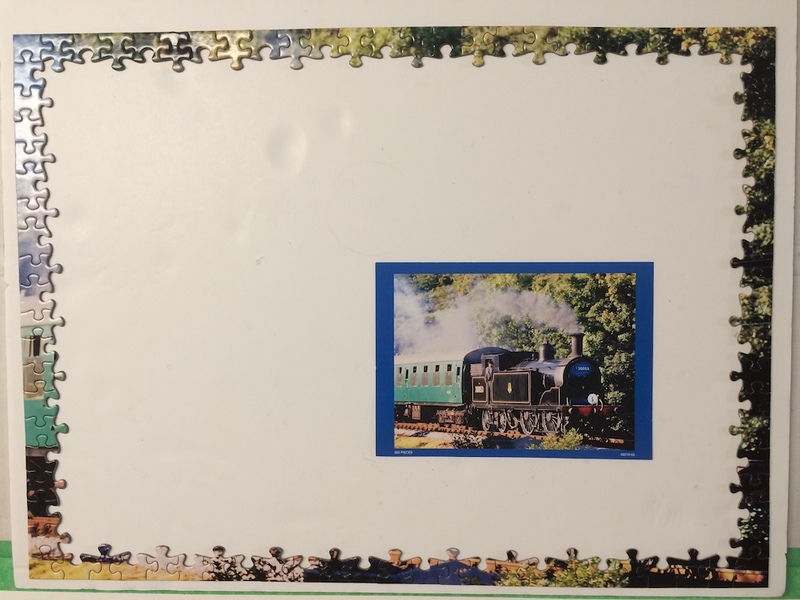 However, during assembly when I wanted to move sections, the pieces did not stay together. 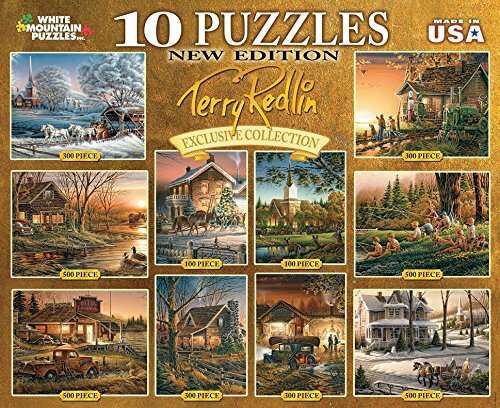 I am in the process of recording all my past jigsaw puzzles that I still have for my walls and all my current puzzles. 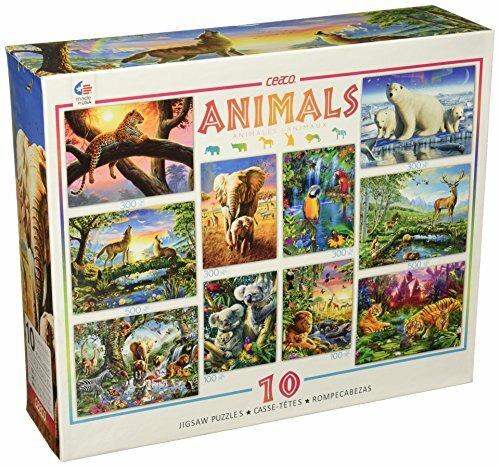 Need some suggestions on the best lights or lamps to work jigsaw puzzles? 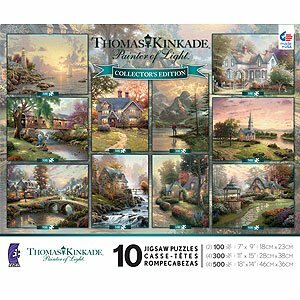 We have some suggestions for lights to use for jigsaw puzzles that are most commonly purchased by puzzlers. 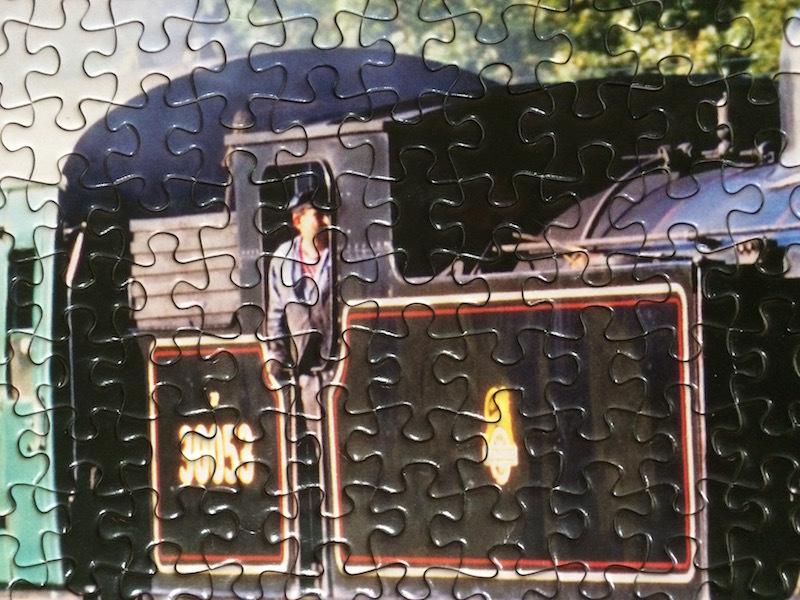 Tis the season for a Standout Falling Stars Jigsaw Puzzle. Immerse into the silent night of snow falling onto the rooftops. 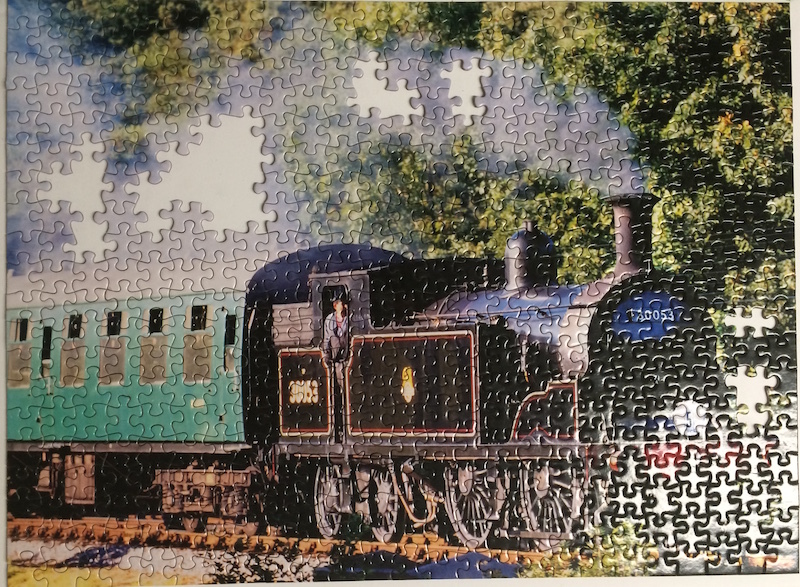 Sign up here for the Jigsaw Puzzle Hobby Newsletter to stay updated on events, Give-Away notifications, discounts, Group topics and more.